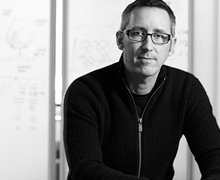 Scott Wilson is a designer, serial entrepreneur, and all around game-changer. We asked him if he considers himself an entrepreneur by nature. He laughed and said, “Well, after five startups, maybe going on eight in a year, I guess you could say I’m an entrepreneur.” He is the former Global Creative Director of Nike, has led design organizations such as IDEO, Thomson Consumer Electronics, Fortune Brands, and Motorola, and jumped from job to job, leaving when he felt it was time to learn more. He said, “I got hooked on being a part of the end-to-end experience, especially at Nike where they allowed me to drive as much of the process as I wanted.” He dove in to all aspects of the design process, and hasn’t looked back since. In 2007, he founded his studio MINIMAL (MNML) and balances the practice 50/50 between fee-based work, risks and startup ventures. This philosophy rang true when in November of 2010, Scott embarked on a journey that no one else would take a risk on—he launched a Kickstarter campaign that would transform that iPod Nano into a multi-touch watch wristwatch, the TikTok+Luna Tik. The idea for the watches started as a simple sketch, a way to teach himself some modeling software. He made a prototype, and thought, maybe people other than himself would like it. He started showing it around and the reaction was less than enthusiastic. Scott said, “People told me it was too expensive, that it had to be cheap, that it had to be plastic. I said no, and I put it up on Kickstarter to see what people really thought.” He raised nearly $1 million dollars in 30 days, broke all of the records, became the face of successful crowd funding, and inspired a wave of entrepreneurs to follow suit. Oh yeah, and the campaign was so successful that it spurred Apple’s sales of the Nano, talk about influence. Scott showed that same courage when he invested a couple of weeks of work into a side-project, spent 200 dollars on a prototype, and took a Sunday to make a video. He put it up on Kickstarter and changed the way the world thinks about crowd funding. He has paved the way for others to dream big and make their ideas real. Check out MNML’s website and blog to learn more about their truly, innovative, and inspiring products.